PACIFIC for April 25: Bob Iger vs. Brian Roberts. PACIFIC: Bob Iger vs. Brian Roberts. What's Next: Bob Iger vs. Brian Roberts. Well-placed sources tell me Disney and 21st Century Fox are scheming a counter-counter offer for Sky now that Comcast has officially made its bid for the British broadcaster. What remains to be seen is whether Disney will cut out Fox as the middle man and lead the pitch itself. 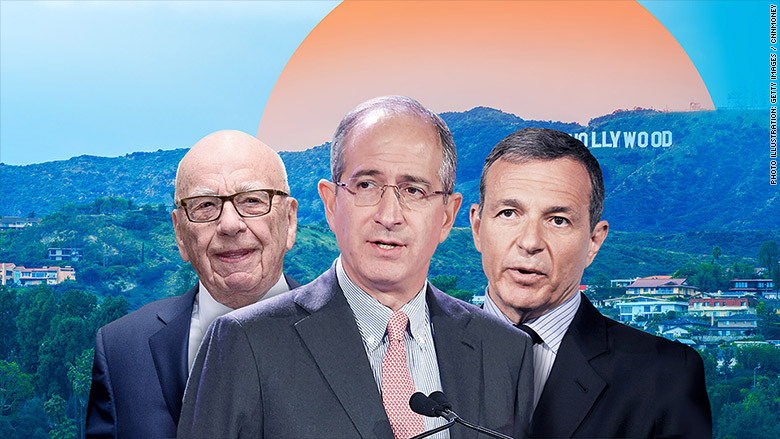 The latest: Comcast filed its $31 billion offer for Sky this morning, besting Fox's previous offer and throwing a wrench into Disney's $52.4-billion Fox acquisition. Iger has called Sky a "crown jewel" of the Fox assets. • Iger comes back with a higher offer. None of our sources believe Iger and Murdoch will cede this one to Roberts. But it's a win for Roberts either way: even if he doesn't win the asset, he drives up costs for Disney. The Big Picture: The entire tech, media and telecom sector is consolidating. Both Comcast and Disney see Sky as a key asset for European expansion as they scale up to compete with the tech giants. Sky has 23 million customers across Europe and rights to coveted content like the English Premiere League. Good morning. I'm en route to Washington. Murdoch and Jerry Hall were among the guests at the White House's State Dinner last night for French President Emmanuel Macron. Apple CEO Tim Cook was also there, along with Apple policy VP Lisa Jackson. Cook will meet with President Trump today and is likely to advocate for detente in the brewing U.S.-China trade war. Or, as Trump tweets, "We will be talking about many things, including how the U.S. has been treated unfairly for many years, by many countries, on trade." What they drank at dinner: A 2015 Domaine Serene "Evenstad Reserve" Chardonnay and a 2015 Domaine Drouhin "Laurène" Pinot Noir. Both wines are made from French grapes grown in Oregon soil, and were served to highlight the historic friendship between the United States and France. • "Twitter posted its second consecutive profitable quarter on Wednesday thanks to renewed growth in its ad sales business." • "The company reported a profit of $61 million for the first three months of 2018 ... Twitter reported its first profitable quarter as public company in February." • "Much of the revenue growth came from Twitter's international markets, which are now on the cusp of overtaking Twitter's U.S. ad revenue." • In a letter to shareholders, Twitter said user growth "could be 'negatively impacted' by the General Data Protection Regulation (GDPR) ... set to take effect in Europe next month." • On a conference call with analysts, CEO Jack Dorsey said Twitter is "different from our peers" because its data business is built on information that users share publicly, rather than privately. Facebook reports today after the bell. It is the company's first Wall Street trial since the Cambridge Analytical data scandal. • "GBH Insights analyst Daniel Ives ... called this earnings report a 'pivotal barometer' for investors and a 'key step for investors to either boost their confidence in the Facebook story going forward or raise further red flags.'" • "The consensus estimate among analysts is for Facebook's sales for the first three months of 2018 to hit $11.4 billion, up more than 40% from the same period a year earlier. Its profit is expected to climb nearly 30% to $1.35 a share." • "Analysts are concerned about how much an ongoing backlash among users, advertisers and politicians on both sides of the Atlantic could slow down a company once viewed as unstoppable." • Kevin Martin, Facebook's vice president of mobile and global access policy, has been promoted to interim head of policy, replacing Erin Egan. • The shuffle comes amid federal and congressional scrutiny over its handling of data privacy, as well as new regulations in Europe. NYT's Cecilia Kang has more. • Snap, which moved to Venice in 2013, is now moving to Santa Monica, but "commercial real estate brokers predict Snap's influence on the neighborhood will remain." • "Snap dramatically drove up office rents when it arrived five years ago." ... Rent per square foot was $38.61 in 2009. Now its $70.55. • "The tenants that fill that space are likely to be other tech companies and startups." How we see it: Venice (where we used to live) is still one of the greatest neighborhoods in the world on a Sunday morning or a Tuesday evening. It's a bridge-and-tunnel nightmare on Friday and Saturday nights. Best restaurant in old Venice: Axe (R.I.P.) ... best restaurants in new Venice: Felix, Gjelina. Bonus: Snapchat is experimenting with a redesign to its redesign, per my colleague Jordan Valinsky. The biggest change is reuniting friends' Stories with content from brands, celebrities and publishers. Stock is down 7% on the news. (BI's Kaylee Fagan has more). Background: Evan Spiegel on how Snapchat is separating social from media, from November. • "Cable networks for children ... are now in a free fall ... as Netflix, YouTube and other streaming services have taken off." • "This season's ratings for the 2-to-11 set are shaping up to be the worst yet. ... Viewership of the three most-popular networks for the very young -- Nickelodeon, the Disney Channel and the Cartoon Network -- is down more than 20 percent." • "Netflix is ramping up the competition further by bringing more youth-oriented production in-house. Last year, it hired Melissa Cobb away from Nickelodeon ... [It] also poached two writers ... from Walt Disney Co.'s Disney Channel. Bonus: THR's Kim Masters asks if John Lasseter can ever return to Disney: "As the most powerful man in animation nears the end of a six-month 'sabbatical' for personal 'missteps' ... Bob Iger must soon determine his fate." • "The company has been on the biggest growth spurt in its 10-year history, closing in on 20 million subscribers ... up 18% in just the past four months." • "That's still a fraction of Netflix's 125 million global subscribers or Amazon's 100 million Prime customers ..."
• "The overheated market for content ... has pushed up the cost of talent to a point where smaller players like Hulu often get priced out." • "Hulu's annual war chest is said to hover above $2.5 billion ... chump change compared to Netflix's $8 billion global content budget for this year, or even Amazon's $4.5 billion for last year." What Next: For our friends in the Beltway: "The 12 Best Covert Coffee Spots in D.C.," via Eater: "Schedule off-the-record conversations and job interviews here." See you tomorrow, from Washington.